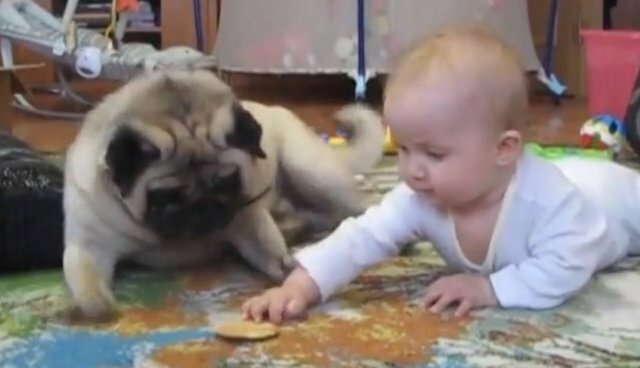 Babies and dogs often team up to make some pretty adorable partnerships. And this one is no different -- even when they're fighting over the last cookie, they're still astonishingly cute. Although they may fight over treats, it can actually be good for a baby's health to have a dog around -- a 2012 study in the journal Pediatrics found that infants who grow up in a house with a pet are less likely to get sick than children who grow without one. Scientists theorize that exposure to pet dander and other microbes primes babies' immune systems, making them better able to fight off illnesses later in life.